At Cityskin we are passionate about giving you the best possible results from your treatment. We are open and honest about the cost of treatment, how many units you may need and how the treatment is likely to look. We love providing as much information for you as possible so you are fully informed about anti-wrinkle treatments before your consultation. If you have any questions about treatment then please contact us and we will get back to you with an answer. By law, we are not allowed to use the real names of the products so we have to call them ‘anti-wrinkle injections’ rather than use the brand names. Anti-wrinkle injections cause relaxtion of muscles and the reduction of lines. The relaxation of muscles takes approximately 5 – 12 days to work and the effects last for up to 4 months. Which areas can I treat with anti-wrinkle injections? Other treatments that we offer are: ‘bunny lines’ (lines next to the bridge of the nose), gummy smile treatment, treatment of a downturning mouth, brow lift and the Nefertiti lift. When anti-wrinkle injections are performed we place a small amount of anti-wrinkle product into the muscle. This product prevents the nerve from telling the muscle to contract (see diagram below). How long does it take for anti-wrinkle injections to work? It takes between 5 and 12 days for the anti-wrinkle product to take effect so results are not instant. The peak effect of the anti-wrinkle injections is at 2 weeks. The “European” brand of anti-wrinkle product generally works quicker than the “American brand” (the most commonly known anti-wrinkle brand in the world). In clinical studies, the muscle contraction may start to slightly come back at about the 60 day mark after injection, then full muscle contraction should be back at the 90 day mark. Everyone is slightly different, and depending on the dose injected, this may vary between patients. Once the muscle contraction completely comes back, the muscle will contract exactly how it used to before injection, in time. This means, to prevent wrinkles, repeat injections will be needed to give long-term results. Anti-wrinkle products are made of a protein which is broken down naturally by the body. Ideally the effects of anti-wrinkle injections should last 3-4 months but it can vary depending on the strength of the muscle (the stronger the muscle the more anti-wrinkle ‘units‘ that you need) and how quickly your body breaks down the product. How long have anti-wrinkle injections been used on patients? Anti-wrinkle injections have been used to treat patients for over 30 years. There are no known long term side effects from having treatment. If you have faint lines the treatment should reduce the lines entirely. If you have deep lines, especially lines at rest, it may take more than one treatment to fully improve the appearance of the line. Click on the video below to watch Dr Brown discuss this more! What is an anti-wrinkle ‘unit’? You may have come across the term ‘anti-wrinkle units’ when searching in Google or talking to friends. A ‘unit’ is simply a measure of anti-wrinkle product. We know that certain amounts of units work to reduce muscle movement in certain areas. If you have never had treatment before and would like to read all about ‘units’ then click here. How many ‘units’ do I need to treat my lines? 6-12 units each side to the crows feet. Men have stronger muscles than women and, generally speaking, need approximately 1.5 times more units than women to treat the frown and forehead areas. We have a full treatment guide for men here. Anti-wrinkle injections cost from $4 per unit at Cityskin, depending on the brand used. For more details have a look at our cost page. 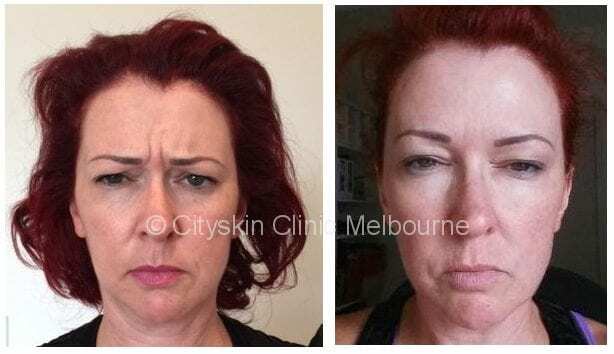 Cityskin offers anti-wrinkle injections in Melbourne and Sydney. We charge from $4 per unit and do not charge a consultation fee. Our Sydney clinic is based in Sydney CBD. Dr Brown discusses crows feet treatment and how we treat them at Cityskin. Click on the video below to find out more. Frown lines or the ’11’ mark are the lines inbetween the eyebrows. It is normal to have these lines when frowning but some people have these lines when at rest. If you have strong frown lines at rest you may feel that you look angry. Anti-wrinkle injections can safely and easily treat these lines and the effects last for up to 4 months. Read our full guide to frown line treatment here. Watch our guide on how we treat frown lines with anti-wrinkle injections. Forehead lines are common as we age. These lines are caused by the use of the forehead muscle ‘frontalis’. If you look in the mirror and lift the eyebrows you can see frontalis in action, lifting the eyebrows. Read our full guide to forehead line treatment here. There are a number of ways to treat upper lip lines. Anti-wrinkle injections can be used to soften these lines (4 small injections of 0.5 units in each injection point). We often use dermal filler to help give the upper lip area more support and less prone to wrinkling. Anti-wrinkle injections can be used to treat tooth grinding and to slim the face. Have a read of our facial slimming and bruxism (tooth grinding) treatment guides. What is the difference between anti-wrinkle injections and dermal filler? We often get asked what the difference is between anti-wrinkle injections and dermal filler, as this topic causes some confusion. 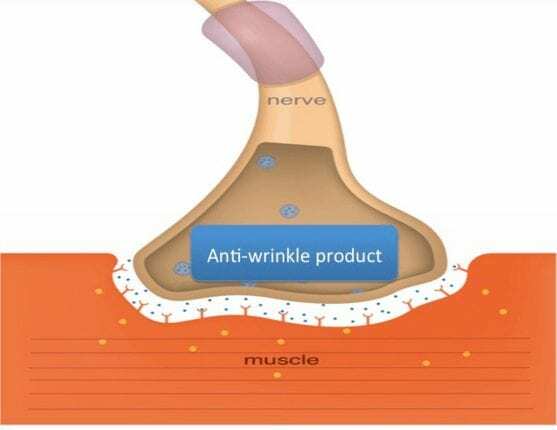 Anti-wrinkle injections prevent muscle movement and in doing so reduce lines. Dermal filler is a gelatinous product which is injected under the skin to replace lost volume. Dermal filler can ‘plump’ up the skin. Imagine the skin being like a circus tent with poles to hold it up and keep it taut. As we age the canopy of the tent becomes looser and we lose volume which allows the skin to become saggier. When we inject dermal filler it is like putting extra poles up to lift the canopy of the tent up to make it taut again. The other way of looking at dermal filler is that it treats shadows on face. As we age we lose collagen and volume and this can cause shadows going down from the corner of the mouth. Which is the best anti-wrinkle brand? There are 2 main brands of anti-wrinkle product in Australia. Dr Brown discusses which brand is best in this short video. 3. I’m not sure about the clinic reputation and the person performing the treatment. 5. How common is a droopy eyelid after treatment? 6. How do patients feel after treatment? 7. How much do treatments cost? 8. Anti-wrinkle myths – what can I do after treatment? We will address all these concerns one by one to help you understand more about the treatment and our views on how your treatment should look. The frozen look often looks terrible. There was a vogue about 10 years ago when anti-wrinkle injections were fairly new where patients had lots of treatment to the forehead to stop forehead lines. The lines were reduced but it gave a shiny, frozen look. I’m sure you can name a few celebrity examples of the frozen look and it doesn’t look good at all. ii) If you are going to treat then use very small amounts. I (Dr Brown) have my forehead treated to reduce the fine lines and nobody would guess because the nurse uses very small amounts when treating me. Read about how to avoid the frozen look here. Time and time again we hear that patients want to have natural results. There is sometimes stigma around having cosmetic treatments and often patients don’t want their friends, family or sometimes even partner to know that they have had treatment. Natural looks are easy to achieve and it is the skill of the injecting medical expert to understand where to place the injections to give the natural result. At Cityskin we performed a survey of 50 patients to see how they felt and looked before and after treatment. The most common words to describe how people felt and looked before treatment were, “Tired, wrinkly, stressed and worried”. After treatment the most common words that patients used to describe themselves were, “Fresh, resfreshed, great and youthful”. When asked what compliments they received after treatment, the most popular words were, “Well, young, good, refreshed, relaxed and amazing”. Not once did the word ‘frozen’ or ‘un-natural’ come up. We want you to feel more confident about yourself without people guessing that you have had treatment. For us, that is a great result. Trust is a huge factor in deciding where to have your treatment performed. The cosmetic industry can be slightly murky with websites often not showing before/after photos, not discussing costs and not disclosing information about themselves. We feel that open-ness, transparency and care before AND after your treatment are vital and we make this our priority. At Cityskin clinic we treat over 8000 people per year. We are full open about the cost we charge for treatment (see the ‘cost’ page for prices) and do not charge a consultation fee. You can contact us before the treatment to ask any question (click on the ‘contact us’ link at the top). Education is important and we train Doctors and Nurses in cosmetic treatments. You can read all about our medical specialists and watch educational videos on different treatments. Feedback is important as it allows you to read about the experience of other patients. Have a read of patients reviews here. 4. How painful are anti-wrinkle injections? Conclusion: The results show that, for patients having anti-wrinkle injections for the first time,injections are less painful than patients expected. Results: The average ‘expected’ pain was 5.48 out of 10 and the average ‘actual’ was 3.90 showing that injection are significantly less painful than patients expected. 5. How common is a droopy eyelid after anti-wrinkle injections? Thankfully a heavy eyelid, known as a ptosis, is incredibly rare after anti-wrinkle injections. We quote a 1 in 7,000 chance of a temporary heavy eyelid after treatment. If a heavy eyelid occurred it would last approximately 2 weeks and have no long term side effects. Eyedrops can be used during the 2 weeks of heaviness until the effect wear off. Our expert medical injectors have years of training and are extremely careful when treating the brow to avoid eyelid heaviness. 6. How do patients feel before and after anti-wrinkle injections? 7. How much do anti-wrinkle injections cost at Cityskin? Can I do exercise after anti-wrinkle injections? Can I drink alcohol after anti-wrinkle injections? Can I lie down after anti-wrinkle injections? Yes you can. There is no evidence to say that you can’t lie down or sleep after treatment so go ahead! Things that you CAN do after anti-wrinkle treatment: lie down, exercise, go to the gym, drink alcohol. 1. What Brand of anti-wrinkle treatment are you having? There are 3 brands of anti-wrinkle treatment in Australia and they vary in cost, how quickly they work and how long they last. Clinics will not always tell you which brand they are using, as people assume it is always the American Brand. We are very open at Cityskin about which brands we use – ask us on the day. The European brand starts working quicker than the well known American brand and they last for about the same time period, as long as it hasn’t been diluted too much! (see below). Always ask your practitioner which brand you are receiving. 2. How much is the anti-wrinkle product diluted? Ask your injector what dilution they are using to make sure you aren’t being short-changed. We always tell patients that there are 2 brands that we use at Cityskin Clinic: an American brand (the most well known brand in the world) and a European brand. This is where it starts to get confusing. We feel that you need to have 3 times as many European units to have the same effect as 1 unit of the American brand. Most clinics give patients 2.5 times as many units but at Cityskin we feel that a 2.5:1 ratio isn’t strong enough and you are being short changed. We feel that the golden number that you need is 3:1. If you have easy crows feet you might only need 5-6 units each side to reduce the lines. Some clinics can treat ‘areas’ but you have no idea how many units you are receiving which means you may be paying much too much. At Cityskin we treat by unit rather than by area. The photos below show patients who have have anti-wrinkle injections at Cityskin. By law we have to mention that results can vary.